Homemade baby shower gifts always are unique, special and personal and often make a great keepsake to be treasured for a whole lifetime. Something homemade is just more 'valuable' than a ready made and 'just bought' gift. There are DIY baby craft projects for all levels and even beginners will be able to do most of these easy crafts. But if you still feel you cannot do it or if you do not have the time, you can always buy a homemade baby gift on platforms such as Etsy (www.etsy.com). 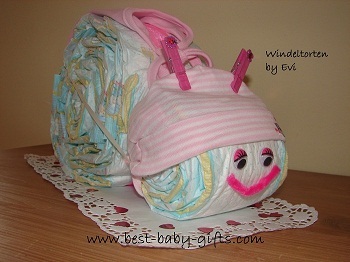 And homemade diaper cakes can be found at the great shops featured in my diaper cake gallery. But before you go and buy a ready-made handmade gift, first check my instructions and see whether it is really impossible to do it yourself...!? Diapers are always needed and if they are 'decorated' as nicely as in a diaper cake or a whimsical diaper animal, they sure make a great baby shower gift! Find everything you need to know about making a diaper cake, a diaper bouquet and a diaper animal as well as tips, tricks and directions here. If you are close to the new mum such as a sister, best friend or sister in law, a baby time capsule makes a very individual and personal baby shower gift. This is an easy present to put together but it needs some preparation and must be well-planed ahead. Here you find all you need to know about baby time capsules, over 35 ideas on what to include in a baby time capsule gift and how to make your time capsule. Create a baby bump model to always remember the (final) stage of pregnancy. 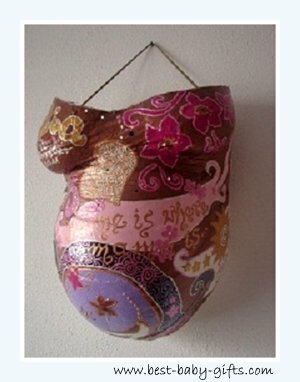 A baby belly cast is a beautiful keepsake item for baby's nursery and an awesome homemade baby shower gift to treasure for a long time. You can also offer to decorate and hand-paint the belly cast with acrylic paint afterwards. There are baby belly casting kits as well as belly cast decorating kits. Even though, in regards to the decorating kit you can always just buy acrylic paint and some brushes on its own. Finish and decorate the cast with sparkling rhinestones, fluffy feathers, plastic flowers, etc. to give it the icing on the cake. As I said before a 3D baby belly model is such a great keepsake gift. On the other hand this will take quite a lot of space to display. So there's another option: turn just mummy's pregnant belly into a work of art and make some photos to keep. For that purpose, there's a kit available, too. Using this kit will be fun for the whole family. The paints included in the kit are non-toxic, paraben-free, water based and FDA approved. They are easy to apply and to remove. Think about this kit as an alternative. always follow the instructions on the belly cast kit! the mom to be can sit while the upper cast is done but for the lower cast she must stand up - no lying position! A homemade heating pad for baby is quite easy to make if you have a sewing machine and know how to use it. Alternatively to cherry pits you can also use spelt or buckwheat to fill the pillow. For instructions search google for 'homemade heating pad'. A baby gift basket or mum & baby gift basket really is an easy project to make! You buy most of the ingredients and then just arrange them nicely in a basket and do a bit of decoration. 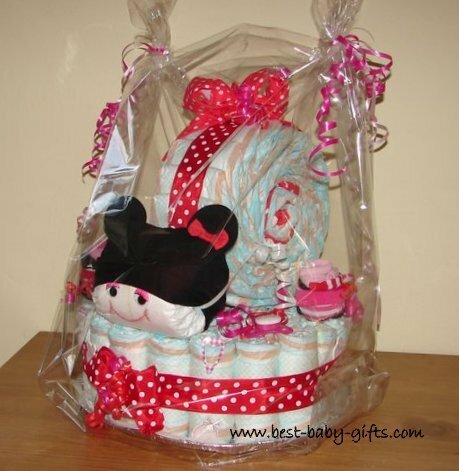 If you want to, center your basket around a theme such as mum & baby gift basket, princess baby gift basket, (baby) food gift basket, baby books gift basket, luxury baby gift basket, etc. 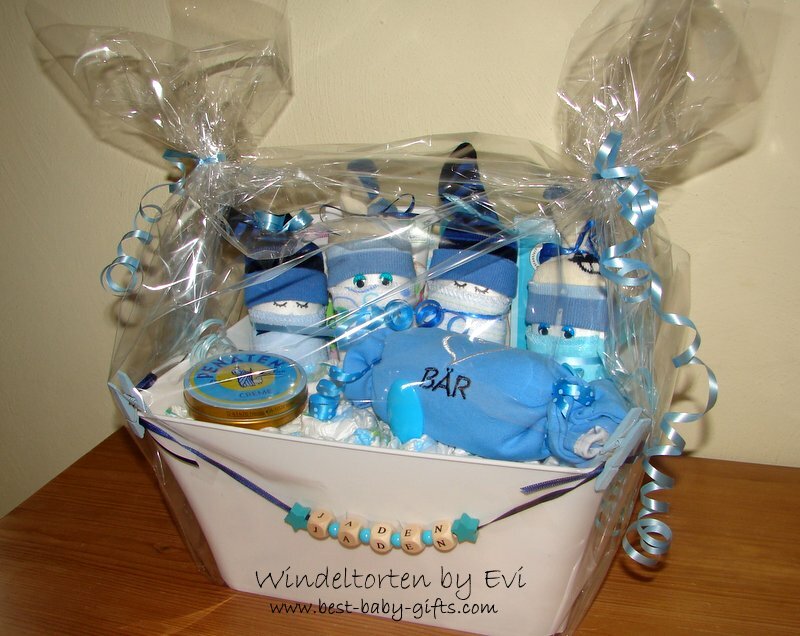 How to make a (theme) baby gift basket. More great homemade baby shower gifts are baby blankets, a baby room plate, nursery wall letters and many more. See these and more ideas and directions here: homemade baby gifts. Return From Baby Shower Gifts to Best Baby Shower Gifts.